The OSU Safety Purchase Assistance Program provides a method to help fund safety-related purchases that promote a safer work environment. These purchases shall be intended to prevent, or reduce the severity of, an occupational (work-related) injury, illness, or disease. Sprains and strains to the lower back, knees, and shoulders are prime examples of common and costly occupational injuries at OSU. These injuries are often the result of a combination of repetitive motions, twisting, or applying excessive force while lifting, carrying, pushing, or pulling. Consequently, specific equipment or training intended to address these, or similar, issues would likely be eligible for the program. Pending review and approval, Enterprise Risk Services will reimburse up to 75% of the cost (capped at $5,000.00 per request) of qualifying purchases. Your request will generally be assessed using the following methodology. First responder training (e.g. first aid, CPR) is reactionary, does not address the root cause of the incident, and is employed in response to an incident, rather than as a preventative measure. An Automated External Defibrillator (AED), for the same reasons stated previously. Oregon OSHA mandates that, with few exceptions, personal protective equipment (PPE) must be provided by the employer at no cost to the employee. In this case, the employer would be the employee’s operational unit, typically a department. Capital Planning and Facilities Services (CPFS) is responsible for the stewardship of capital infrastructure resources such as buildings, utilities, and environmental control equipment. A good rule of thumb: If the end-user changes location (i.e. a department moves into a new area) and the item in question would remain, then it’s likely a CPFS responsibility. Departments are expected to budget for, and provide, safety-related capital resources in conjunction with CPFS. Does the request have the capacity to serve the larger OSU community? Potentially, in situations where multiple qualifying requests are vying for limited resources, requests that have the capacity to benefit a larger group of stakeholders may be given a weighted preference. For example, a request to purchase a training video that could be hosted online and presented to any OSU employee with internet access would hold preference over a training video that served a small special interest group. PPE: OR-OSHA mandates that this is an employer incurred expense. The goal of ergonomics is to work towards a safe & healthful work environment free from recognized hazards by fitting the job to the person rather than making the person fit the job. Consequently, ergonomics is preventative in nature and by design. Ergonomic versions of these items (e.g. chair, stool, keyboard, mouse, adjustable height desk) are becoming increasingly ordinary and cost comparable with non-ergonomic versions. And, as the useful life is relatively short, departments are expected to include these items in budgetary considerations for regular replacement. Task-specific, non-computer workstation, equipment that either assists an injured worker in performing their normal work duties, as described in their Position Description, or as part of modified work assignment until such time that they can resume their normal work duties. CPFS: Eyewashes, Safety Showers, Fume Hoods, Fire Suppression Systems, Security Locks/Cameras. Fall protection, Confined space, Shop safety: These types of trainings are all designed to prevent occupational injuries and would be eligible under this program. Digital content, such as video, is a prime example of a resource that could also be leveraged to benefit other departments globally via an EHS hosted website. While certainly worthy skills to promote, First Aid, CPR and AED responses are reactive rather than preventative, and are universally applicable to both occupational and non-occupational settings and personnel. 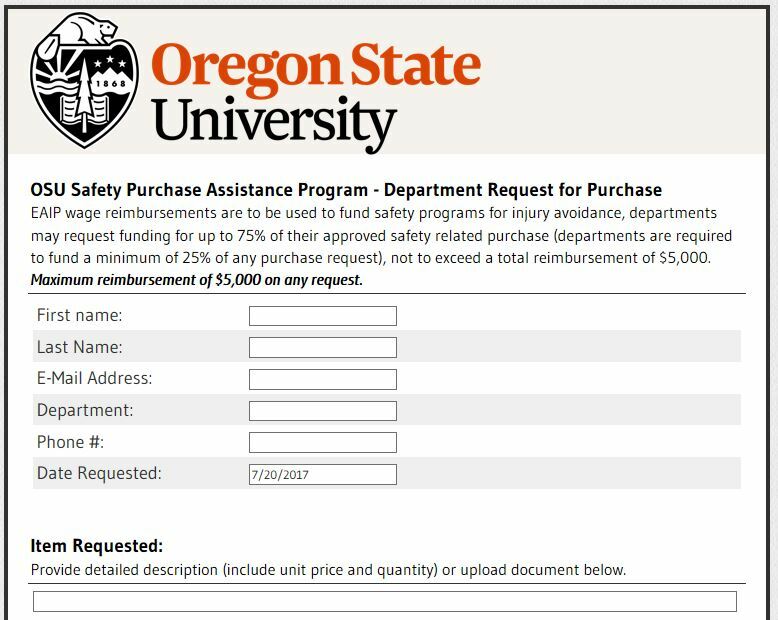 The OSU Safety Purchase Assistance Program documentation may be downloaded and reviewed. Please contact the OSU Occupational Safety Officer with any questions.